Born and educated in Sichuan, Liao Zhenwu often paints the ubiquitous motorcycles of his mountainous homeland. With a backdrop of winter’s gray skies, his gritty black-and-white paintings capture the smoky atmosphere of hordes of motorcyclists with their innumerable passengers. According to critic Gao Ling, Liao’s recent series of paintings reflect his impressions of the interactive relations among groups of mannikins in Beijing shop windows. “Based on the living environments he is familiar with,” Ling states, “Liao first told us stories about the town he lived in and then describes the shop windows of the metropolis,” in effect, providing us “time tags”–the artist’s generic title for his paintings–for those periods. 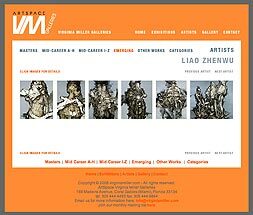 In the prestigious “2007 Chinese Contemporary Art Document,” a juried catalog of the most important artists now working in China, Zhenwu commands three full pages featuring three large illustrations of paintings in his “Times Tag” series.